Hut hut! Angel City Brewery will be offering a 25% discount on all growler fills and kegs this weekend to help kickstart your super bowl celebration in style. Available Friday through Sunday; kegs require a 48-hour advanced notice. Call or visit the brewery for more details. 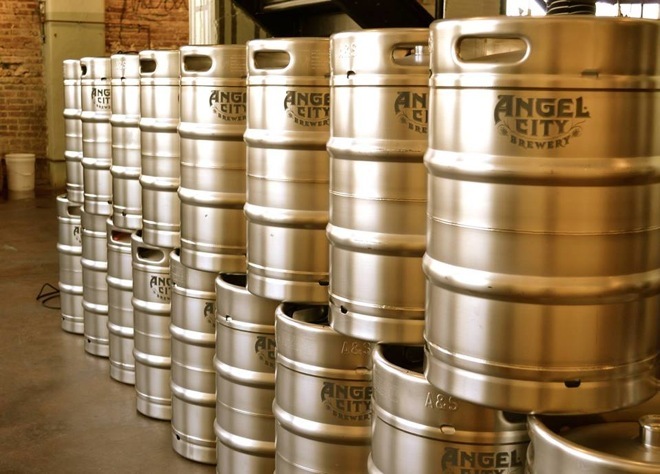 > Angel City Brewery, 216 S Alameda St., Downtown, 213-622-1261. Hop to it: Beachwood BBQ & Brewing’s tasty Melrose IPA is back in bottles and is now available at both Beachwood locations: Long Beach and Seal Beach. Per their website, Melrose IPA is: “A full-blown ‘West Coast’ IPA chocked full of sticky hop resins.” It’s brewed with American 2-row malt and a bit of honey, which complements the flavors of the Simcoe and Amarillo hops. > Beachwood’s super bowl take-out specials are kick-off ready: platters of smoked chicken nachos, smoked buffalo wings, or pulled pork sliders are available for pre-order and pick-up. The Long Beach location is also offering $1 off any Beachwood growler fill. ($2 off with any food purchase.) More information. > Beachwood BBQ & Brewing, 131 1/2 Main St., Seal Beach, 562-493-4500; and 210 E 3rd St., Long Beach, 562-436-4020. Ready to rumble? Golden Road Brewing is opening the doors of its semi-private event space, Chloe’s, for super bowl Sunday. They’re airing the big game on a very big screen—120 inches, bro—and serving up their full pub menu along with plenty of beer. Contests, prizes, and hijinks will also ensue. No cover; RSVPs to greenwood@goldenroad.la are strongly recommended. More information. > Chloe’s at Golden Road Brewing, 5410 W San Fernando Rd., Atwater Village, 213-373-4677. One pill makes you larger: Did you miss Eagle Rock Brewery’s 4th Anniversary party last weekend? That means you missed a taste of their newest beer, White Rabbit, an Imperial Witbier with “a bold citrus character and subtle hints of chamomile and coriander”… not to mention a bold 11% alcohol by volume. Not to worry… it’s on draft at the brewery starting today, and for a limited time, will also be available for growler fills. > Eagle Rock Brewery, 3056 Roswell St., Eagle Rock, 323-250-2337. > They’ve also got their third anniversary celebration coming up on February 8, with unlimited pours of 34 of their beers on tap, live music, and five food trucks in attendance: The Grilled Cheese Truck, Dos Chinos, Seabirds Truck (a personal favorite that’s also vegan! ), BACON MANia Truck, and Slater’s 50/50. Tickets start at $40. More information. > Noble Ale Works, 1621 S Sinclair St., Suite B, Anaheim, 714-634-2739.